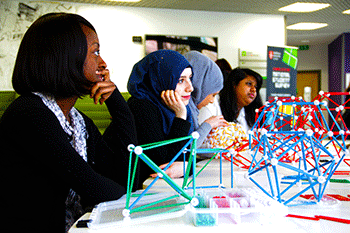 Advanced mathematics requires a creative approach to problems, and in February First Year maths students at Middlesex put on their artistic hats for a series of sculpture workshops with American mathematician George Hart. The Stony Brook University research professor has made it his mission in life to show the world that 'maths is cool', and these days spends more time teaching mathematics though his popular sculpture workshops than he does standing at the front of a classroom. "Some of the enjoyment and pleasure of math has been lost in our modern culture because people are forced to learn arithmetic and certain rules, and they end up thinking that that is all math is," says George. "They don't realise that there is so much more." Over three days, George worked with Middlesex students to create a series of sculptures from playing cards and the modelling kit Zome Tools, before they moved on to create two giant mirror-image sculptures to go on display at the University. "There are many things about structures, and relationships and symmetry that are mathematical ideas that you can teach in this informal way," explains George. "Mathematicians see generalisations and deeper patterns behind everything, so when people are making sculptures I take opportunities as they come up to talk about the mathematical thinking and ideas behind them." It is a unique approach to learning, but George believes this method helps students see their mathematical studies from a new angle. 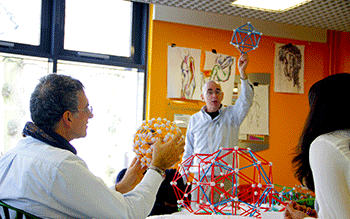 And it ties in perfectly to the hands-on approach to mathematics teaching adopted at Middlesex. Dr Matt Jones, Associate Professor and BSc Mathematics course leader, was delighted to invite George to come and work with students. "Maths is a creative subject that requires an understanding of the underlying patterns and structures of abstract as well as concrete subjects," explains Matt. "George's workshops inspired both students and staff to think this way. His breadth of knowledge is incredible so his work with our students provided a great opportunity for them to develop as mathematicians." One of our first year students also took part in the workshops and says they were great fun and also helped her classmates get to know each other better. "This has been really nice," she says. "It brought the whole class together for a break from the usual and we got to have fun with maths and art too."